Hot, Explosive, High energy original R&B Blues with a nice dose of Funk and Soul frosted with soaring guitar and vocal work. The debut CD by Pacific Northwest singer, songwriter, producer, and guitarist Dean Reichert is a strong fusion of R&B, Blues, Rock, Funk, and Soul. When asked the question "who does this guy sound like?" You can come up with a lot of "I hear a little's". I hear a little Delbert, I hear a little early Steely Dan, and I hear a little Tower of Power. But what I really hear is an artist who has taken the last 20 years of his musical influences, and fused them into a style that is original, and fresh. That's not an easy thing to do these days. Honing his musical skills through the 70's, and 80's in Portland OR, Dean landed the guitar chair with Jazz fusion great Jeff Lorber and played on Jeff's second album "Soft Space". "Seeing my name on the same album cover as Jeff Lorber, Chick Corea, and Joe Farrell was a total mind blower." Dean also spent a lot of time in the club circuit in and around the Portland area. After spending a couple of years living on the road in the late 80's, Dean moved back to the Portland area and stumbled right into the middle of a thriving Blues scene. Dean jumped in with both feet and ended up as musical director for the award winning Margo Tufo Blues Band. Not long afterwards, Dean moved to Seattle and again found his way into the top local bands surrounded by A+ players. Dean spent 2 years with LJ Porter and another year with Korla Wygal among others besides having several bands of his own in the Seattle area. Dean has also been on stage and in the studio with: Larry Correll, Nokie Edwards, Jerry Miller, Tim "Too Slim" Langford, "Little Bill" Engelhart, Kenny G, Tom Grant, DK Stewart, The Wailers, Seattle Women, The Blues Power Revue, Butterbean, and Grammy Nominated Kathy Hart. Toward the late 90's Dean got the urge to write and record again so he built a small home studio and got busy working on a Smooth Jazz project but was again drawn back to the blues and decided to do something more "R&Bish", hence the start of Misty's Joint. During this time Dean recorded, produced, and co-produced 3 CD's for other local artists. One of them, Mark Riley's "Confessions of a Mad Man" was nominated "Best Blues CD" of 2003 by the Washington Blues Society. Though side tracked by these projects, he continued work on Misty's Joint and ended up enlisting the services of former Capital Records, and Steve "Fly Like an Eagle" Miller engineer, producer Rick Fisher to do the mix down and mastering. The results were outstanding. "Considering this is my first CD, I think it stands up well and has a lot to offer"
I would have to agree. Let's also not forget that Dean is one of the finest guitarists in the Pacific Northwest and is well deserving of his dues. Just listen to his solo work on Misty's Joint and decide for yourself. I know I'm looking forward to many more releases from this talented musician! Misty’s Joint doesn’t just go into my play list, it goes in my car. What do you get when you put Coco Montoya, Tab Benoit, and the Blues Brothers in the same room? Dean Reichert. Misty’s Joint is one of the best Blues & Soul albums I’ve received this year. 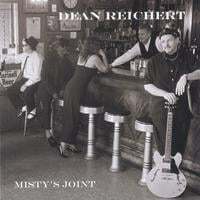 Misty’s Joint by Dean Reichert doesn’t just go into my play list rotation, it goes in my car. Dean Reichert knows what the groove is about! me the most is his vocal and smooth soul singing. Great! I am very impressed with this CD. I play it while driving my taxi in Las Vegas and frequently get asked who the artist is and great reviews from them as well. I have met Dean on and seen him perform on several occasions and find him to be an extremely talented artist as well as a true gentleman. Great R&B and funk compositions with wonderful guitar riffs! This is a really superb CD, with catchy R&B and funk compositions and fantastic guitar play. Dean's work is so good, it deserves a wide audience. "Cold Love", with its wailing guitar solos, and "Misty's Joint", with its tight brass funk backup, are two favorites which stack up with anybody's best. Give it a listen and you'll be glad you did.